I have been using anti-aging skincare products since my early 20s (in my opinion, it's never too early to start taking care of your skin) but have always stuck to my tried and true favourite brand. Now that I'm older, however, I've decided to experiment with some other lines to see what else is out there. 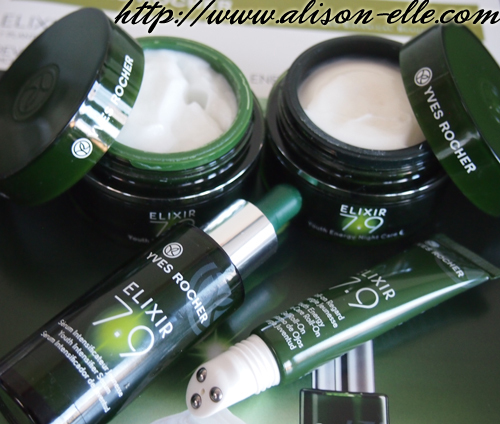 Lucky for me, a few months ago I was sent the Yves Rocher Elixir 7.9 system, which is targeted to people aged 25 years and older to slow down the formation of wrinkles and reactivate the skin's natural moisturization and protection processes. The line is backed by 12 years of research and a combination of 7 plants with anti-aging power (green rice inositol, apple oligosides, aphlioa extract, beet root extract, sandthorn seed extract, aloe vera polyosides, and tara seed extracts) that are recognized by 9 patents. The Youth Intensifier Serum ($56 CAD for 30 mL) is applied morning and night on clean skin. In the day, I've been using the Youth Energy Day Care ($56 CAD for 40 mL) for normal to combination skin (there is also a dry skin formula and a sensitive skin formula). I really like the creamy gel texture, which feels very lightweight. At night, I apply the thicker balm-like Youth Energy Night Care ($56 CAD for 40 mL). After my respective creams, I have also been using the Youth Energy Eye Care Roll-On ($42 for 15 mL), which has a 3-bead applicator that massages and contours the eye area. I love the cooling sensation but I think I need a miracle product to get rid of my undereye circles! Overall, I like this line though I'm not sure I've seen any radical changes in my skin in the months I've been using it. Admittedly, I didn't have many visible wrinkles or fines lines to begin with (please stay away forever, haha) so perhaps it is doing its job as a preventative measure. I also haven't experienced any breakouts and the products have lasted a long time even with everyday use. This is a good thing given the fact that these products aren't cheap since I suspect their prices might be a deterrent for some. There are, thankfully, skin care refills ($49 CAD) available, which are an ecological and economical option and can easily be popped into the empty cream jars once done. This looks so wonderful! And I agree with you. It is never too early to start taking care of your skin. same thing happens to me when I use products that are made for reducing wrinkles, etc but I don't have wrinkles so it's hard for me to see the difference. As long as the product doesn't dry out my skin or make me break out, but instead keep moisture then I am a-okay! Never tried anything of this brand but I'd love to. I am a skincare addicted and I heard wonders about Yves Rocher products ! Shame it's not absolutely phenomenal but at least it didn't completely break you out and be horrible! I have used the Elixir 7.9 line but from 2009? Is it the same? I quite liked it ash's can't quite remember why I stopped! I found all the products incredibly hydrating and no wrinkles yet! Knock on wood! I believe the Serum has been around for a few years but the three new lines (for different skin types) are recent innovations. Take care of skin is a good way for beauty, great review!